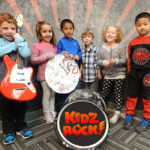 Specifically designed for the 4-7 age group, KidzRock allows a child to experience the ultimate musical accomplishment within a few weeks; singing, playing and performing in a rock band! 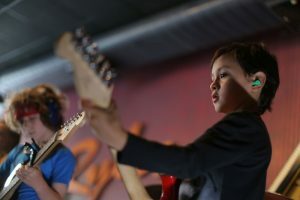 We’ll engage young children in music education through a curriculum that combines basic musical concepts in in the environment of a performing rock band. Kids take turns playing drums, keyboards, and a custom-string guitar, with lyrics written by the kids themselves! KidzRockers get a chance to perform for an enthusiastic crowd at the Band Bash! KidzRockers get a chance to perform for an enthusiastic crowd at the BandBash!